• What is the Masters Loan Scheme? • What can I get? • When can I apply? • Will I be charged interest on my loan? • How do I repay my loan? • What if I already have a student loan? 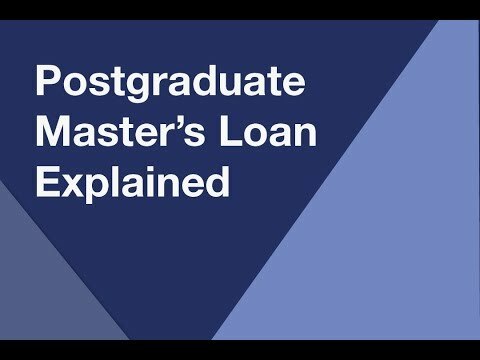 What is the Masters Loan Scheme? Loans are now available for many of our Masters courses. Eligible courses starting in the 2019/20 academic year will allow eligible students to apply for up to £10,906. The loans, for both taught and research Masters degrees, will be available for a number of our full-time, part-time and distance learning courses, across all disciplines and subject areas. Further details on the new loans and if you are eligible can be found below. You have to be studying a taught or research Masters course. You must study the whole course - i.e. you cannot claim exemption from any module as a result of credit gained through Recognition of Prior Learning (RPL) or be studying a Masters course as a ‘Top-up’ to a Postgraduate Certificate or Postgraduate Diploma course you completed previously. You must not already have a Masters degree or higher qualification. You must be under 60 at the start of the first academic year of your course. You must normally live in England*. You can be studying at a university or college or by distance learning. If you’re studying full-time your course can last for one or two years. If you’re studying part-time you can study for two years (for the equivalent one year full-time course) or up to four years (for the equivalent two year full-time course) so long as you study 50 per cent of the intensity of the equivalent full-time course. *If you are a UK student, however EU students may also be eligible for the loan. You can check the full criteria on the gov.uk website. You can apply for a loan of up to £10,906 as a contribution towards your course and living costs. Your payments will be spread out across the length of your course and will be paid into your bank account in three installments each academic year. Applications for the Masters Loan for 2019/20 entry is now open. If you’ve taken out a loan with Student Finance England before you can use your account to apply. If you don't have an account you will need to set one up. You can find out more at www.gov.uk You’ll only have to apply once, even if your course is longer than one year. Will I be charged interest on my loan? Interest is charged at the Retail Price Index (RPI) plus three per cent from the day we make your first payment until your loan is paid in full. Repayments will be based on your income, not what you borrow. If you’re studying full-time you’ll start making repayments the April after you finish or leave your course. If you’re studying part-time you’ll start making repayments the April two years after the start of your course or the April after you finish or leave your course, whichever comes first. However, no repayments towards Masters Loans will be taken before April 2020 and only when your income is over the current threshold of £404 a week, £1,750 a month or £21,000 a year. If you’ve had any other loans from the Student Loans Company for your undergraduate course, you’ll also repay these loans. For example if you took a loan for your undergraduate course that started after 1 September 2012, you’ll repay nine per cent of your income over £21,000 towards that loan and six per cent of your income over £21,000 towards your Masters Loan. So you’ll repay 15 per cent of your income over the threshold in total. *If you’re repaying a student loan for your undergraduate course that started on or after 1 September 2012. The government-backed loans will be available for many of our Masters courses. Courses and modes of study that qualify are listed below. If your course is not listed but you believe it should be, please contact studentfunding@leedsbeckett.ac.uk. Please be aware, when you apply for a loan, any full-time course in excess of one year (such as 15 or 18 months) must be entered as a two-year course.